For other uses, see Cooperation (disambiguation). This article is about Cooperation as used in the social sciences. For co-operation in evolution, see Co-operation (evolution). For the economic model, see Cooperative. Cooperation (sometimes written as co-operation) is the process of groups of organisms working or acting together for common, mutual, or some underlying benefit, as opposed to working in competition for selfish benefit. 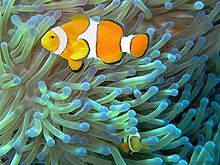 Many animal and plant species cooperate both with other members of their own species and with members of other species (symbiosis or mutualism). Humans cooperate for the same reasons as other animals: immediate benefit, genetic relatedness, and reciprocity, but also for particularly human reasons, such as honesty signaling (indirect reciprocity), cultural group selection, and for reasons having to do with cultural evolution. Language allows humans to cooperate on a very large scale. Certain studies have suggested that fairness affects human cooperation; individuals are willing to punish at their own cost (altruistic punishment) if they believe that they are being treated unfairly. Sanfey, et al. conducted an experiment where 19 individuals were scanned using MRI while playing an ultimatum game in the role of the responder. They received offers from other human partners and from a computer partner. Responders refused unfair offers from human partners at a significantly higher rate than those from a computer partner. The experiment also suggested that altruistic punishment is associated with negative emotions that are generated in unfair situations by the anterior insula of the brain. It has been observed that image scoring[clarification needed] promotes cooperative behavior in situations where direct reciprocity is unlikely. In situations where reputation and status are involved, humans tend to cooperate more. Cooperation is common in non-human animals. Besides cooperation with an immediate benefit for both actors, this behavior appears to occur mostly between relatives. Spending time and resources assisting a related individual may at first seem destructive to the organism’s chances of survival but is actually beneficial over the long-term. Since relatives share part of their genetic make-up, enhancing each other’s chances of survival may actually increase the likelihood that the helper’s genetic traits will be passed on to future generations. The cooperative pulling paradigm is an experimental design used to assess if and under which conditions animals cooperate. It involves two or more animals pulling rewards towards themselves via an apparatus they can not successfully operate alone. Some researchers assert that cooperation is more complex than this. They maintain that helpers may receive more direct, and less indirect, gains from assisting others than is commonly reported. Furthermore, they insist that cooperation may not solely be an interaction between two individuals but may be part of the broader goal of unifying populations. One specific form of cooperation in animals is kin selection, which can be defined as animals helping to rear a relative’s offspring in order to enhance their own fitness. Different theories explaining kin selection have been proposed, including the "pay-to-stay" and "territory inheritance" hypotheses. The "pay-to-stay" theory suggests that individuals help others rear offspring in order to return the favor of the breeders allowing them to live on their land. The "territory inheritance" theory contends that individuals help in order to have improved access to breeding areas once the breeders depart. These two hypotheses both appear to be valid, at least in cichlid fish. Studies conducted on red wolves support previous researchers' contention that helpers obtain both immediate and long-term gains from cooperative breeding. Researchers evaluated the consequences of red wolves’ decisions to stay with their packs for extended periods of time after birth. It was found that this "delayed dispersal," while it involved helping other wolves rear their offspring, extended male wolves’ life spans. These findings suggest that kin selection may not only benefit an individual in the long-term in terms of increased fitness but in the short-term as well through enhanced chance of survival. Some research even suggests that certain species provide more help to the individuals with which they are more closely related. This phenomenon is known as kin discrimination. In their meta-analysis, researchers compiled data on kin selection as mediated by genetic relatedness in 18 species, including the Western bluebird, Pied kingfisher, Australian magpie, and Dwarf Mongoose. They found that different species exhibited varying degrees of kin discrimination, with the largest frequencies occurring among those who have the most to gain from cooperative interactions. The components in a cell work together to keep it living. Neurons create thought and consciousness, other cells work together and communicate to produce multicellular organisms. Organisms form food chains and ecosystems. People form families, tribes, cities and nations. Atoms cooperate in a simple way, by combining to make up molecules. Understanding the mechanisms that create cooperating agents in a system is one of the most important and least well understood phenomena in nature, though there has not been a lack of effort. Individual action on behalf of a larger system may be coerced (forced), voluntary (freely chosen), or even unintentional, and consequently individuals and groups might act in concert even though they have almost nothing in common as regards interests or goals. Examples of that can be found in market trade, military wars, families, workplaces, schools and prisons, and more generally any institution or organization of which individuals are part (out of own choice, by law, or forced). For many years, the prisoner's dilemma game pointed out that even if all members of a group would benefit if all cooperate, individual self-interest may not favor cooperation. The prisoner's dilemma codifies this problem and has been the subject of much research, both theoretical and experimental. Results from experimental economics show that humans often act more cooperatively than strict self-interest would seem to dictate. While economic experiments require subjects to make relatively abstract decisions for small stakes, evidence from natural experiments for high stakes support the claim that humans act more cooperatively than strict self-interest would dictate. One reason may be that if the prisoner's dilemma situation is repeated (the iterated prisoner's dilemma), it allows non-cooperation to be punished more, and cooperation to be rewarded more, than the single-shot version of the problem would suggest. It has been suggested that this is one reason for the evolution of complex emotions in higher life forms. ^ a b c d Lindenfors, Patrik (2017). For Whose Benefit? The Biological and Cultural Evolution of Human Cooperation. Springer. ISBN 978-3-319-50873-3. ^ Kohn, Alfie (1992). No Contest: The Case Against Competition. Houghton Mifflin Harcourt. p. 19. ISBN 978-0-395-63125-6. ^ Fehr, Ernst. "Altruistic punishment in humans" (PDF). Macmillan Magazines Ltd. Archived from the original (PDF) on 29 September 2011. Retrieved 20 July 2011. ^ a b c Sanfey, Alan G.; et al. "The Neural Basis of Economic Decision-Making in the Ultimatum Game" (PDF). Science. Retrieved 20 July 2011. ^ Wedekind, Claus. "Cooperation Through Image Scoring in Humans". Science. Retrieved 20 July 2011. ^ a b Hamilton, W.D. (1964). "The Genetical Evolution of Social Behaviour". Journal of Theoretical Biology, 7, 1–16. ^ Balshine-Earn, S., Neat, F.C., Reid, H., & Taborsky, M. (1998). "Paying to stay or paying to breed? Field evidence for direct benefits of helping behavior in a cooperatively breeding fish". Behavioral Ecology, 9(5), 432–38. John McMurtry, "How Competition Goes Wrong." Journal of Applied Philosophy, 8(2): 200–10, 1991. Dennis Rivers, NewConversations.net, The Seven Challenges: A Workbook and Reader About Communicating More Cooperatively, fourth edition, 2005 – treats cooperation as a set of skills that can be improved. M.J. van den Assem, D. van Dolder and R.H. Thaler (2010). "Split or Steal? Cooperative Behavior When the Stakes are Large"
Look up cooperation in Wiktionary, the free dictionary.